Place all the ingredients in a food processor and pulse until it resembles bread crumbs. Form into ball, wrap in plastic wrap and refrigerate for 30 minutes. Roll out pastry dough. Place in a prepared 12 inch by 12 inch quiche pan. Cover sides also. Whisk eggs, cream and mustard to fully combine. Season well with salt and black pepper. Arrange salmon, red onions, basil and goat cheese crumbles in pastry shell. Pour egg mixture into pastry shell. Season with salt and black pepper. Bake 40 to 50 minutes or until set. Sprinkle extra parmesan cheese on top. Allow to rest for about 10 minutes before serving. 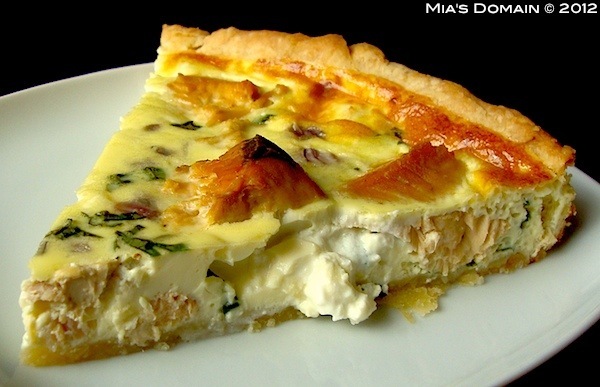 I have had quiche before, but not like this-love the flavors in this recipe and it looks amazing-Yum!